Posted April 7th, 2019 by Mike Boyes & filed under Classification Diagnosis, Clinical Assessment, Consciousness, Motivation-Emotion, Neuroscience, Psychological Disorders. Description: Answer this question quickly off the top of your head: Is it possible for someone to become addicted to internet gaming? If you said yes, think about whether you mean that it is possible for someone to become genuinely addicted to internet gaming like someone could become addicted to heroin or whether you mean that someone could just be more focused on, and spend more time, internet gaming than you, personally, think is a good idea? 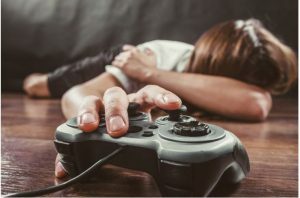 The question of whether an Internet Gaming Disorder should be added to the Diagnostic and Statistical Manual of Psychological disorders was hotly debated during the run up to the 2013 publication of its 5th edition, and the debate is still raging. Whether you answered yes or no to the initial question, have a read through the article linked below for some additional food for thought on this topic. Source: Reevaluating Internet Gaming Disorder, Christopher J. Ferguson, Checkpoints, Psychology Today. So, if we decide to identify Internet Gaming Disorder as a disorder, do we also have start to talk about cat addicts, and running addicts, or even quilting addicts? Those things impact your brain chemistry too. Is the fact that the potential label contains the word “game” (as in something people do that is not a serious part of the “real” world (hockey, football, baseball, and basketball aside, of course – and they are addictive, aren’t they?). The author of the article linked above points out that we are on and perhaps even art way down a very slippery slope in our consideration of Internet Gaming Disorder. Before we simply say more research is needed I think it would be better to say “let’s think about this – think about our assumptions – a bit before proclaiming a new disorder or even before doing more research. What does the proposed Internet Gaming Disorder involve? Can we see useful similarities between possible Internet Gaming Addiction and heroin addiction? So, what do you think? Should the DSM follow the World Health Organization’s International Classification of Diseases and Include Internet Gaming Disorder?